Get even greater deals on sale items and free upgrades! Have a particular color in mind? Quickly narrow your search by color group to find the product you need in the color you want. How fast do you need it? Times specified based on receipt of order by factory and production time. Does not include shipping. Estimated delivery dates provided at checkout. Choose Light Filtering to allow the most light in. Room Darkening filters more light out, but not total light blockage. Blackout blocks 99% of incoming light for your darkest option. Lift and lower your window coverings with a variety of standard and upgraded lift options. Please note that corded window coverings present a strangulation hazard. If you have young children or pets, we recommend cordless options to conform with child-safety guidelines. Slat size refers to the depth of the slat. Shop slat sizes from 1” – 4-1/2”. Customize your coverings with options for narrow windows, multiple units on one headrail, decorative edge bindings, Certified Best for Kids products, upgraded valances and more. Shop by room to quickly find the right product for any window in your home. 2 Blinds On 1 Headrail (7) ? 2 shades on 1 headrail cover patio doors and other large expanses by placing two independently operated shades side-by-side on the same headrail for a clean, consistent appearance. We cover more than windows! 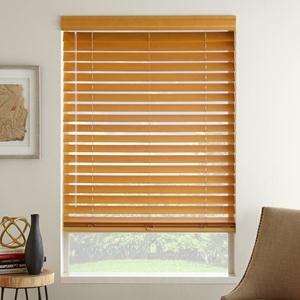 Sort by products for sliding, patio, or French doors and large windows requiring two or more blinds on one headrail. Extra wide or very narrow windows? These products have you covered. Fe fi faux FUN! That’s what you can have when you decorate with our beautifully affordable faux wood products. They look so much like real wood, you’d never know they aren’t. Made from durable vinyl, you can customize these designer-look products for any room in your home with up to 15 colors to choose from. Optional valance upgrades and coordinated cloth tape binding are also available to create your own truly unique window dressing. You can’t fake the benefits of faux blinds. Moisture and humidity resistant, they make the perfect window treatments for bathrooms and kitchens. They’re warp and fade resistant, too – some with UV ratings as high as 500 – so you’ll enjoy years of use from these versatile fake wood window coverings. But the biggest benefit? Getting the look of real wood for a whole lot less. 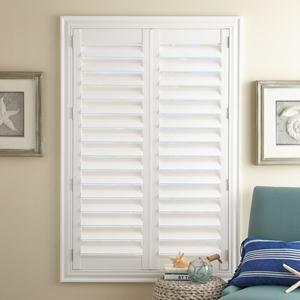 A top choice for low-cost window and door treatments, these luxe looking louvers won’t break your budget while making a great design statement you can bank on! Give your style a lift – and keep young children and pets safe – with our cordless easy lift systems. Our economical fauxwood selections are available in classic cordless lift, Cordless Lift & Lock™, easy lift and tilt, or for the ultimate in convenience, remote controlled motorized lift systems for smooth up and down operation and a chic, clean, no-strings-attached look. Cordless or corded, faux woods can be easily mounted outside or inside the frame. 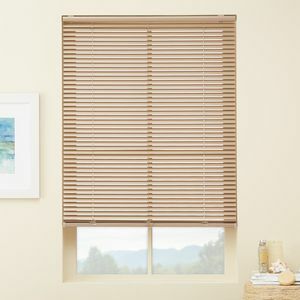 Our faux wood horizontal window coverings come in the traditional 2" slat size. And don’t ‘faux’-get faux wood vertical window treatments with standard 3-1/2” slats are a great choice for sliding and patio doors. Depending on the specific faux wooden product you choose, you have up to 15 different color choices to match your décor and style. Another popular option with faux woods is the addition of decorative cloth tape binding for an elegant, streamlined look. By mixing slat sizes, color choices and decorative cloth options, you can order a customized, unique product for every room in your house. For large windows and sliding glass, patio, or French doors, multiple units can be added to one headrail to create a coordinated, seamless design that’s easier to install and manage compared to one large covering. Using two products on the same headrail also gives you the ability to choose which sections to raise or lower so they don’t interfere with the functionality of doors and windows. Find out how to measure for custom faux wood window treatments!